A rope halter can be a very useful training tool for anyone working with horses, aiding in teaching a horse to give in to pressure by being able to conform the horse's head in ways that leather or webbing halters cannot. World-renowned trainers, such as Clinton Anderson and Pat Parnell, use rope halters in training horses, though the halters sold by these top trainers run on the expensive side. Cheaper versions are widely available, but many people find the best option is to make their own rope halters. A simple rope halter with four noseband knots can be made for the cost of some rope. 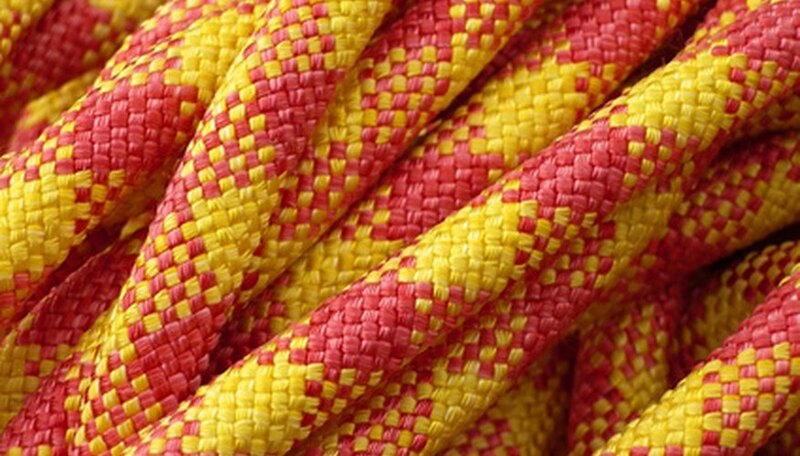 Find pictures or diagrams explaining how to tie overhand and double overhand knots. These are the two knots that will be used in making the rope halter. Practice tying an overhand knot, which is tied the same way as tying shoelaces. Cross the two ends. Loop one end over and under the other end. Practice tying a double overhand knot. Tie two overhand knots together, with the second knot being tied through the first. Tie the first knot without tightening the knot. Slip the end of the rope through the loop, over the first knot, and back down and through the loop of the first knot again. Lay out the rope and tie one overhand knot about 30 inches from one end of the rope. Tie the next knot about 6 inches from the first, then tie another 2 inches from the second. Tie the fourth knot about 7 inches from the third and the fifth 2 inches from the fourth. Tie a last overhand knot about 31 inches from the fifth knot. This sixth knot is the throat latch knot, while the second through fifth are the noseband knots. Leave these knots loose enough to work with in following steps. Make a loop with the rope about 9 inches from the last knot tied and tie an overhand knot with the looped rope to form the tie loop. The tie loop should be about 4 inches long. Tie a double overhand knot through the fifth overhand knot, making sure the rope measures about 9 inches from the tie loop knot to this first double overhand knot. Tie double overhand knots through the fourth, third and second overhand knots also, making sure to keep the length between the knots even with that between the original knots. Measure approximately 31 inches of rope between the last double overhand knot (the one tied through the second overhand knot) and tie a double overhand through the throat latch knot (the sixth overhand knot). Tie a final overhand knot into the first overhand knot. There should be about 9 inches from the throat latch knot to this final double overhand knot. Take the two sections of rope from the first and fourth noseband knots that go to the throat latch knot and hold them together to tie an overhand knot. This knot should form the loop for attaching the lead rope to the halter. Practice tying the knots before attempting to make a rope halter. Rope halters are not intended to be left on horses or used in trailering or tying. It is recommended that rope halters only be used for training or riding to prevent injuries. A correct fit on individual horses may require readjusting and retying some of the knots several times. Rebecca Herron has received a background in education from Bluefield State College which, in addition to four years of study, involved volunteer service in public schools and student teaching split between the elementary and middle school levels. She has written online for various websites.